::: Off the Radar :::: Massive Attack/Thievery Corporation Tix Giveaway! 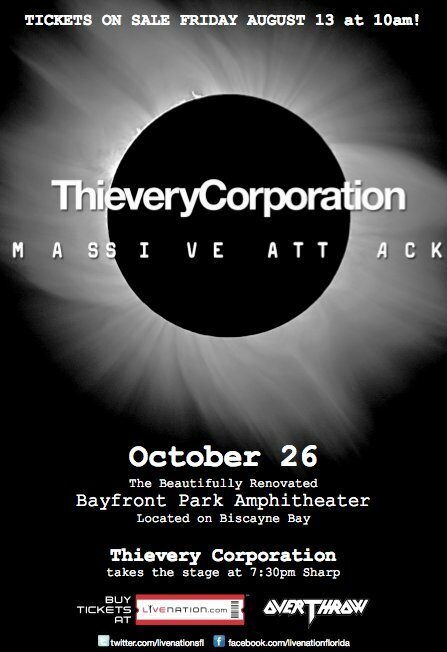 Massive Attack/Thievery Corporation Tix Giveaway! Another big show coming to Miami next Tuesday, October the 26th is the legendary Massive Attack along with co-headliners Thievery Corporation at Bayfront Park. Who knows when Massive Attack will be back in Miami again?! You're not gonna wanna miss these trip hop legends in our own backyard! Comment below with a valid email for your chance to win a pair of free tixs to this one as well! We will pick a random winner Thursday as well. Good luck! P.S. Tixs for this great show are still available via Live Nation if you'd like to purchase some. Below is a video of Massive Attack performing their classic track "Teardrop" live, plus Thievery's video for the lovely "The Time We Lost Our Way". Can't wait to hear these played live! See ya at the show! Cheers! word me want tix ! I did it with an email this time. Yay. Congrats to Carlos #7 for winning tixs to see Massive Attack/Thievery Corp! I contacted him by email, but if for any reason he doesn't respond I will pick another winner. Cheers and thanks for participating! Keep trying we will have many other giveaways and I won't be picking duplicate winners so your chances will get better and better as time goes by.